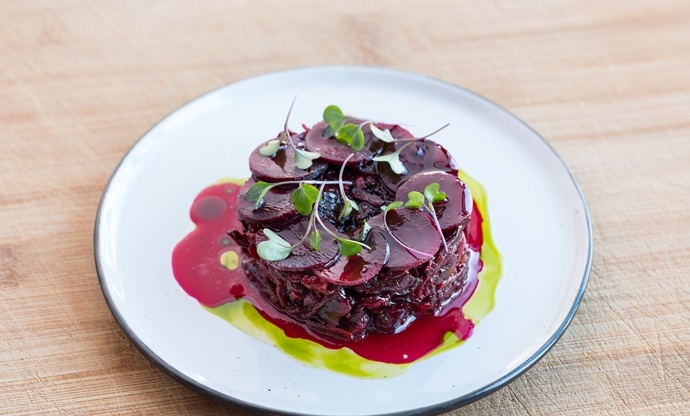 Vegan cooking is in the throes of a renaissance at the moment, with chefs creating plant-based dishes full of incredible flavours and textures that don’t rely on the same old tropes. Here are eight fantastic dinner party vegan recipes, without a piece of tofu in sight. Turn the clock back to just a few years ago, and vegans everywhere in the UK had a pretty hard time finding inspiration for things to cook. The vast majority of meat, fish and dairy-free dishes were either curries, simply replaced the protein with tofu or involved lots of hummus. Those things are all nice in moderation, but can quickly become tiring if they’re all that’s on offer. However, as more and more people become vegan (statistics vary somewhere between one and seven percent of the population), chefs and home cooks are starting to get creative when it comes to plant-based cooking. The following recipes are testament to this new wave of vegan cookery. There’s no tofu, no chickpea curries and a welcome lack of meat substitutes. Instead, the eight dishes are plates that just happen to be vegan. Whether you’re catering for a vegan guest and want to serve something everyone will enjoy or just want to incorporate more delicious vegetables into your dinner parties, these are the recipes to follow. Visit our vegan dinner party recipe collection for even more dishes. This triple dose of oniony goodness combines deep-fried spring onions, a vegan onion purée and a dusting of onion powder. 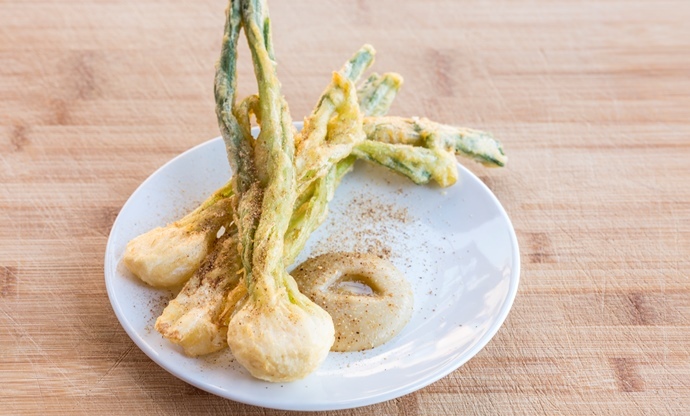 The dish smells absolutely amazing and the crunch of the light tempura batter gives way to the soft, juicy onion within. They make a fantastic snack to serve alongside drinks (a cold, crisp beer would work perfectly) or serve them as a fantastically indulgent starter. 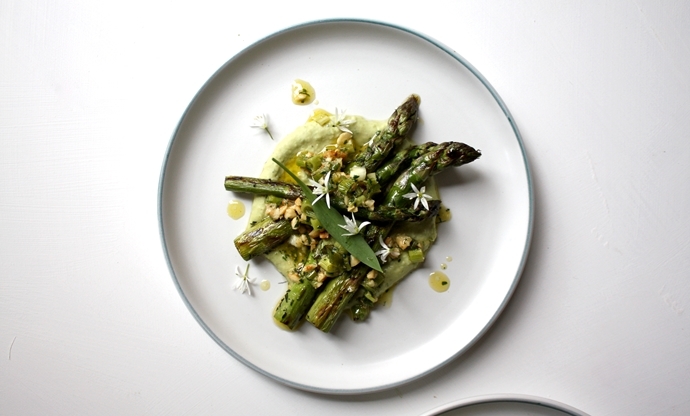 For a vegan dish with a seriously seasonal twist, this pretty plate of asparagus, wild garlic, beans and nuts definitely fits the bill. Lightly roasting the spring onions brings out their natural sweetness, and the wild garlic lends its wonderful flavour to the creamy white bean hummus. Cauliflowers have enjoyed plenty of time in the spotlight lately, and many a vegan has roasted them whole or cut them into ‘steaks’ for a healthy main course. 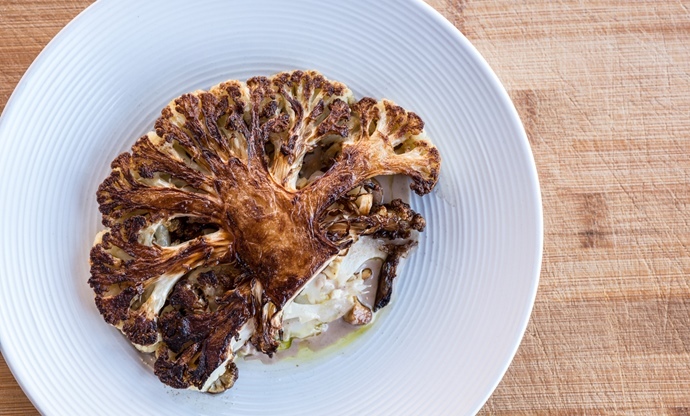 This recipe pairs well-browned pieces of the brassica with a cauliflower purée subtly spiced with curry powder and a cashew nut milk. Fermenting is a great way to bring out the flavour of vegetables, and is much easier than it sounds to do at home. This recipe calls for fermented beetroot, which is both sweet and salty, resulting in a flavour that perfectly complements the earthy hazelnuts and sweet, tangy blackberries. Mushrooms are a vegan’s best friend when it comes to umami – that wonderful savoury taste that meat and Parmesan have in abundance. 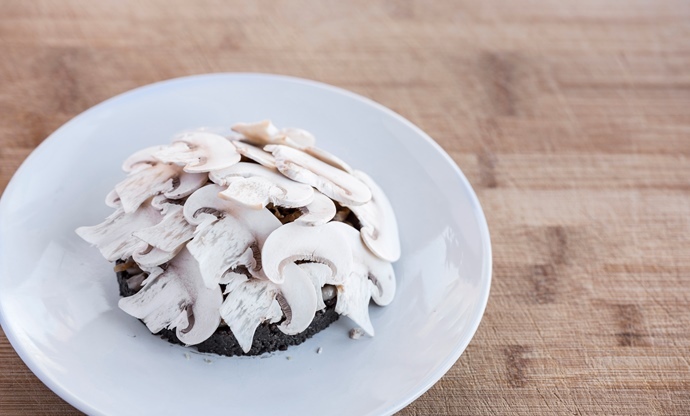 Combining pickled and raw mushrooms with a mushroom duxelle, this pretty little plate is given an earthy boost thanks to the Jerusalem artichokes throughout. 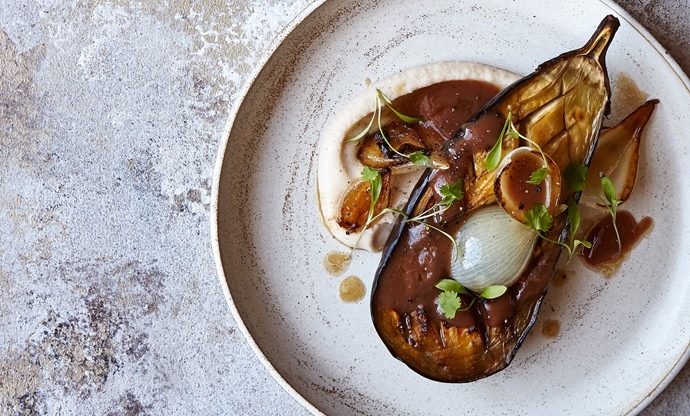 The silky flesh of aubergine is particularly good at soaking up other flavours, and here it’s served with a tangy tamarind sauce, a flavourful homemade vegetable stock, soft sweet onions and a creamy white bean purée. The dish manages to balance sweet, savoury, sour and umami perfectly. 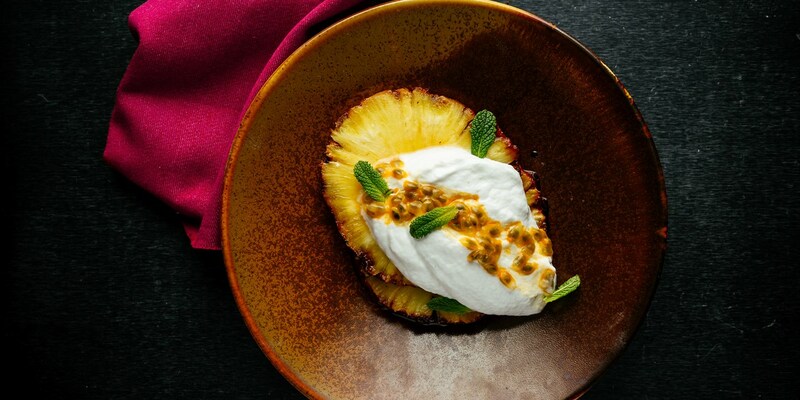 Roast pineapple, a creamy coconut mousse, passion fruit and mint – what’s not to like? 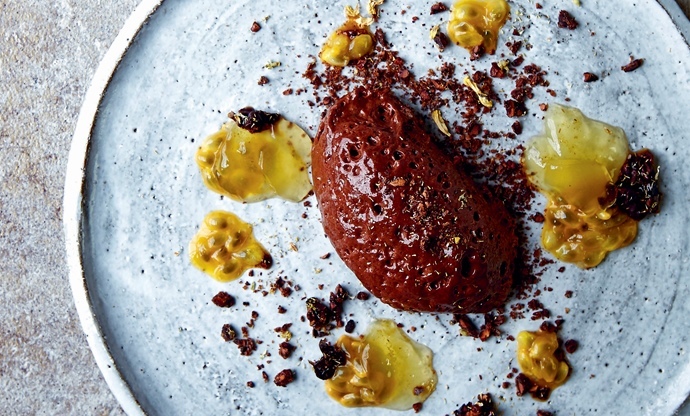 The real star of this vegan dessert is the mousse, which is made from coconut yoghurt and lime without any gelatine or dairy in sight. So many store-bought chocolate mousses contain either gelatine or dairy, but this recipe shows that coconut and oat cream – as well as one of the best vegan ingredients to be discovered, aquafaba – makes a perfect substitute. The passion fruit pulp and chamomile jelly cut through the rich mousse, while the crunchy cocoa nibs add a contrast in textures. 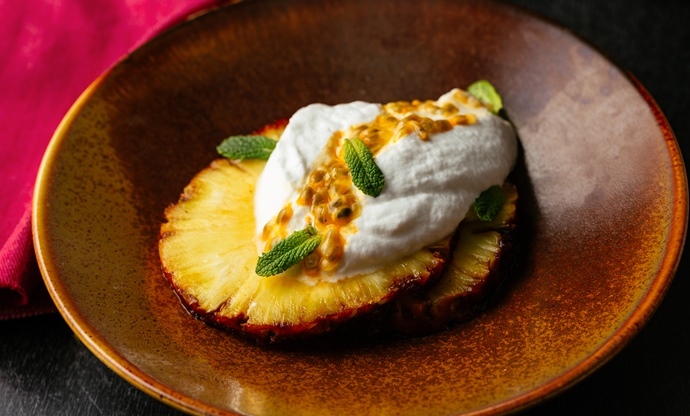 The perfect dessert to prepare for people who turn their nose up at plant-based cooking.